Mother still searching for daughter's killer ten years later: In 2004 Brittany Phillips was murdered in her apartment in Tulsa, Oklahoma. As her family approaches the ten year mark, her mother is still looking for answers, even here in Albany. ........trying to keep the face. be that strong mother who can handle anything. I know its not in vain. It is just selfishly, after all the sh*** I went through with the transmission last year, then the banker from hell almost costing me the house, then the pipes bursting and the car going bad again and it being the 10th anniversary with no suspects matching our DNA and the CARAVAN tours only occurring bonce a year and 1 week of 3 is now through, I am selfishly feeling "Aw come on, don't I get to get at least 1 touchdown.......... I always go on but you know how the years were at DOC. A decade is almost harder than the murder to take because it becomes , realistically so, a solitary path. I just really really needed this to be a good CARAVAN or at least to have NAtional do a story. I have sent 100 emails to the regional city stations and probably about 30 to national. I haven't heard if anyone else is sending national queries about me soooooo. But I am a bobo doll (the clown blowup dolls with the sand in the bottom, you hit them and they fall sideways to the floor but bounce back up...problem is leaks occur........... Thanks guys for your support. 2.5 days in Dallas--no stories 2.5 days in Shreveport 2 stories--Thanks Shreveport for starting the 12th CARAVAN TO CATCH A KILLER tour on such a great note!!! --2.5 days in Baton Rouge/New Orleans no stories --Now in Mobile and no contact yet. Have sent more than 100 emails out total. Calls in the past have never worked. I hoped stories would pick up this CARAVAN after last year’s transmission death shortened CARAVAN. 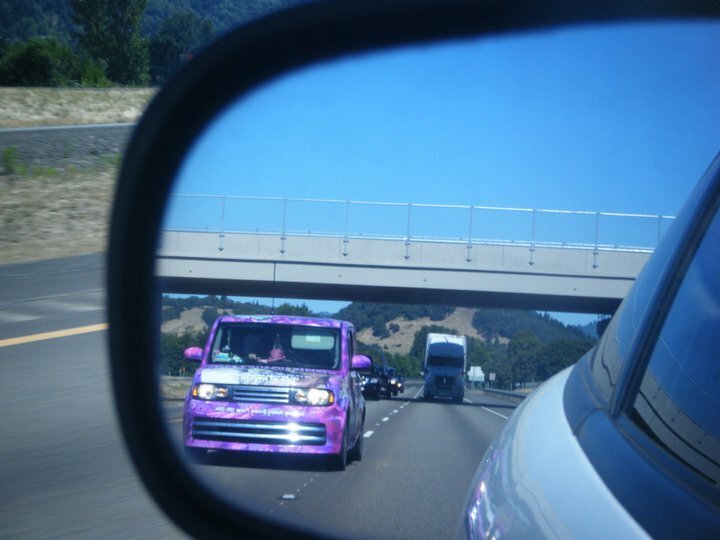 Please, if you see the pink/purple CARAVAN Cube with pictures of my daughter, CARAVAN TO CATCH A KILLER on all sides and a profile of her killer on the back, it would be such a gift if some of you would let national news know you saw us driving down the road. Why is national important? Passing out flyers on street corners helped in the first year after her murder. Yet as crime scene DNA comparisons grew to 800 suspects' with no matches, I had to do more, get her story beyond Tulsa. In addition, a parent losing a child births a cavern inside of their heart, fearing its implosion at any second. Doing something for them, in honor of them helps carry the grief. Tulsa detectives have now compared her killer's DNA to almost 3000 regional suspects and at least half a million in CODIS without a match (increasing the likelihood her killer could have moved on.) This increases the need for a national story. But my requests go unanswered. Thus, I keep trying to do CARAVANs. 7 years mostly self-funded. I don’t ask friends or family for money. I've covered 100000 miles across 46 states and have been gifted 128 stories within 120 cities, all treating her story as the "girl next door". I am 59. In 7 years, I have only covered 1/10000 of what national news would. At this rate, I would be 100 before I could even match half of what national would. Gazing upon Brittany's smile each day as I step into my car, does, at times, have me tell her story through a veil of tears. Her loss, the hollowing part of my heartbeat has not destroyed me. I know people now know her story across the US. I know together, we will diminish the number of families facing this horror. I know my petite, curly headed Britty, my dancing pony princess, her long blond curls framing her angelic face, that with her intense dark brown eyes, she reaches from the sides of my car and she pleads, "Listen to my story, help stop my killer and together also save other daughters." It breaks my heart that right now, it doesn’t feel like anyone is hearing………..
Sunrise again meets my mourning as I begin to pack up and move on from New Orleans. I try not to be sad and I fully iunderstand why all this occurs but it doesn't make it any easier to be alone on the road, alone when I am home and not be able to find a way to achieve this mostly on my own for the last 10 years. At the same time, I will never be able to repay those few people who have been there again and again. The greatest recharge comes from when I am on the road. It is people passing me on the road,showing thumbs up, who talk to me at rest stops, the reporters who do find our story compelling to their communities, you all are the ones who give me strength to go on. But heading towards the decade anniversary in under 3 weeks, being out on the road for almost a week and only 2 strories, no responses at all from the 40 emails sent to various media in both New Orleans and Baton Rogue (these same emails have given us 14-16 STORIES ON PAST CARAVANS. At 10 years, the primary detective has retired, community media friends, who have followed us for years in Tulsa and Oklahoma City, as most reporters do, have moved on. My CARAVAN TO CATCH A KILLER tours have gone from 2 times a year to 1 time a year due to what I can afford. Trying to organize the balloon release at the Capitol on 10/4/14 the 10th anniversary. Trying to get volunteers for the "Walk with Brit on Rt 66; Diminish the risk--needing 4-5 days of drivers driving the WRAP behind me, other needs. So far the usual 2-3 say they will. I have never been able to draw many and not sure why, haven't been able to raise a reward fund etc. It seems now even less volunteers to help with events. When I am around people, they seem to be compelled to help.......................then I stand alone. IF YOU SEE US ON THE ROAD...PLEASE HONK, TELL YOUR LOCAL NEWS YOU SAW US. IF YOU KNOW HOW TO EMAIL, LET NATIONAL NEWS KNOW YOU SAW THIS. IF NATIONAL NEWS COULD SHARE THIS, I COULD STOP AT 103000 MILES. WITH GRATITUDE FOR THOSE WHO DO ACKNOWLEDGE US! !